RSVP ON EVENTBRITE: SECURE YOUR SPOT! REGISTER TODAY! Want to learn how to plan your finances? Want to take a more hands-on approach to money? Then join us for MIND YOUR MONEY. 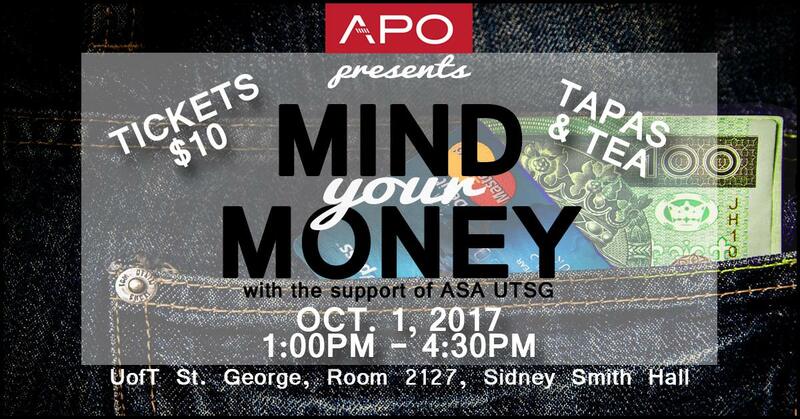 APO would like to present a special Financial Planning event with the support of ASA UTSG! On October 1st, join us for an informative session on budgeting and investing! We are excited to have Waheed Faizi and Hamed Murad share their expertise in the field of finance. Both of our speakers will have tools and tips to help you save for that downpayment or grow your investments! Purchase your tickets on Eventbrite as seats are limited! Light food is included in the ticket price as well as a space to network with other professionals! We anticipate some app usage, so please come prepared with your phone, or what ever you would like to use to take notes. In addition to the informative sessions, our speakers will be there for a Q&A panel, so come with any questions you may have. We will also have networking sessions, and will be providing light food (tapas-style) & refreshments. Get ready to meet some interesting people!